Many people underestimate the power of mental exercise. It can be just as tiring to dogs as physical activity. Mental stimulation should be a part of every dog’s routine, even if they’re still getting regular walks. There are many great puzzle toys on the market. These toys usually have spots to place treats, and the dog must work to get them out. Some even have different difficulty settings or modes. If your dog isn’t a particularly destructive chewer, try filling a water bottle with small treats or pieces of kibble. The dog can shake or roll the bottle to get the food out. Hide and seek is a great indoor game. It also has the added benefit of reinforcing your dog’s recall. Tell your dog to “stay” (alternatively, you can have someone hold or distract the dog) and then hide somewhere. 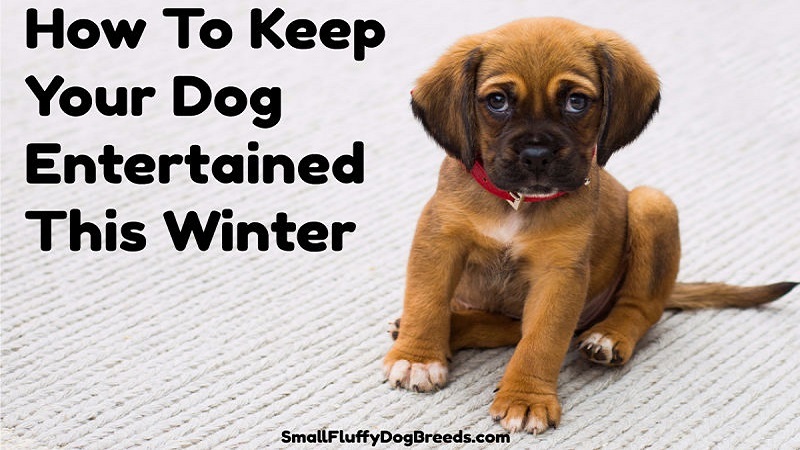 The first few times, make sure it’s an easy hiding place so your dog doesn’t become frustrated or confused. Once you’re hidden, call out your dog’s name; reward with lots of praise and treats when they find you. Consider teaching your dog some new tricks. If you need inspiration, there are plenty of training books and websites out there. The easiest way to teach basic tricks is through the use of a clicker. If your dog isn’t used to clickers, you may have to begin by having them associate the click with treats and praise. Clickers aren’t completely necessary, so use whichever method works best for you and your pup. Agility is a fun sport that many dogs are quick to pick up on (especially if food is involved). It might be difficult to set up certain obstacles indoors, but tunnels and jumps are options. There are companies that produce inexpensive indoor agility kits, for which no stakes or special attachments required. Make sure to start slow, particularly with jumps. Some breeds, such as dachshunds, are more likely to have issues, so make sure to do your research. K9 nose work is a great indoor activity with plenty of mental stimulation. The sport builds on dogs’ innate scenting ability; most will learn quickly, since they’re already used to sniffing out treats. There are inexpensive kits for getting started, but if you’re not planning to compete, you can rig something up at home. A great starting exercise is the cup game. Hide a treat under one cup and shuffle it around with several identical, but empty, containers. If the dog touches or sniffs the correct cup, give them the treat. Many dogs love this game and learn quickly. Eventually, you can try hiding the cup somewhere in the house for added challenge. Winter doesn’t have to be a time of boredom. Instead, try indoor activities and games to entertain your dog. Get creative and pick something that’s fun for both of you.